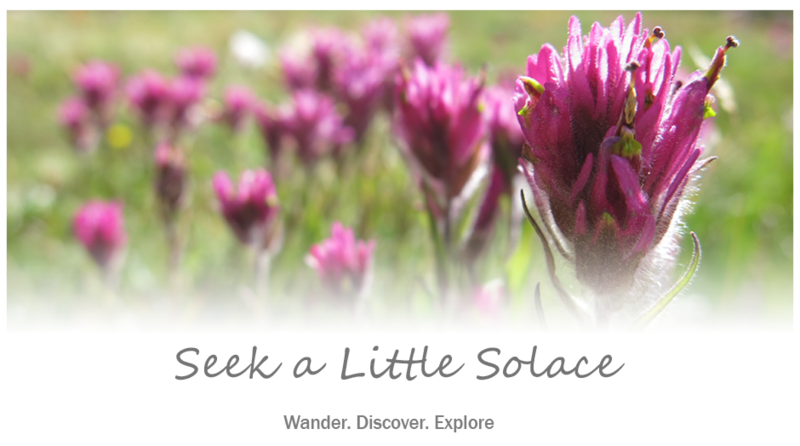 At the last minute, my hubby and I decided to take a break from the everyday and indulge in (what seems to be turning into an annual thing) an adventure of a different sort…Las Vegas…Star Trek convention. Yes. That’s what I said. And while we were there, we experienced quite a few fun Trekkie moments. 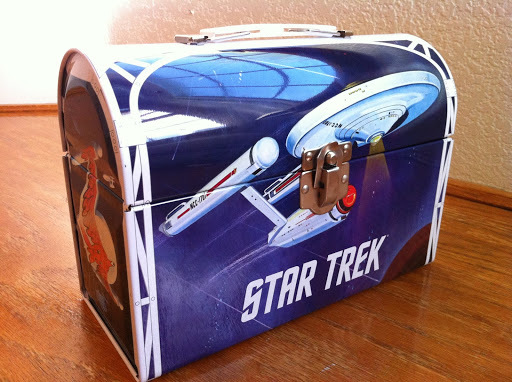 But my favorite was this…Teacher got herself a new lunchbox! As far as Trekkies go, I am an amateur, to be sure. But lunchboxes? Did someone say lunch? Now that’s my thing. And with school starting this week, it was the perfect time to make a super fun addition to the lunchbox collection and get in gear for the new school year. After a few days in Vegas, we had more than our fill of decadent dishes and fancy-pants libations. It was a blast, something fun, out of the norm, but it was definitely good to get home and back to our healthy ways! First order of business was taking in some detoxifying greens, in the form of my favorite green smoothie, while I prepared some healthy lunchbox munchies for the upcoming week. Smoothies are a great way to get your superfoods on busy mornings when you just can’t find time to sit down for breakfast. 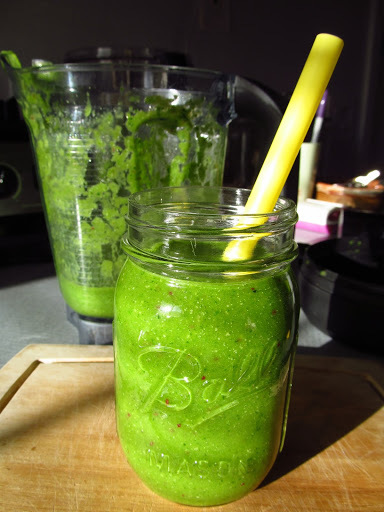 You can put just about anything in the blender, whip it up, pour it in a jar and take it on the road. Bring along a straw and you can sip throughout the morning, giving yourself a steady stream of nutritious energy. I like to make enough smoothie for two and stick one in the freezer for the following day. When the school year is in full swing it can be difficult to maintain healthy lunching munching habits. Your workday starts at the crack of dawn, lunch breaks are short and your energy is in high demand. If you’re not prepared before the day begins, it is all too tempting to run to Subway for a grab-n-go lunch or munch on graham crackers and string cheese when the hunger strikes. I don’t know about you, but those kinds of lunches and munches leave me feeling foggy and sluggish for the rest of the afternoon. So, in order to keep up with the kiddos and maintain some semblance of your alkalizing, high raw, plant-based ways, it is essential to plan ahead. First and foremost, packing your lunch can be so mcuh fun. I like to think of it as a hobby, like sewing or crafting or blogging…something you just enjoy for the satisfaction of the activity, nothing more. There’s just something wonderful about admiring a carefully and artfully packed lunchbox! Secondly, it is helpful to have an arsenal of go-to-multi-tasking ingredients with which you can build any number of fabulously healthy meals. I like to start the week with one or two jars of homemade dressing that can be used to top a simple salad or fancy up some veggies and legumes. This Citrus-Miso Dressing is delicious on any combination of fresh greens and veggies and a sunny addition to any lunchbox. I adore this Green Goddess dressing from Gena at Choosing Raw…it is a work week staple in this household! 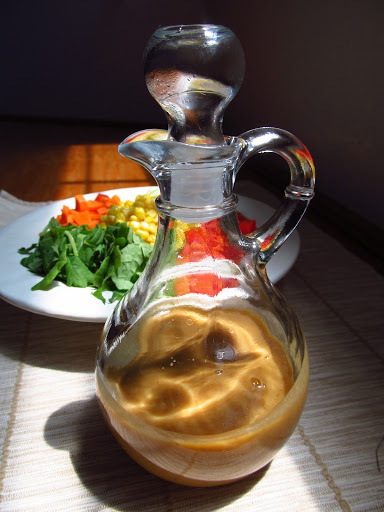 And last week I tried this new Sweet Miso-Tahini dressing from Kathy at Healthy Happy Life. Her Summer Reboot Salad is definitely going in my lunchbox this week! Since you have a couple dressings made and ready to pour, it is wise to have a few salads to go with ’em. I am a huge kale fan, but it’s not always easy to find organic kale in these parts. I recently found this packaged green power at our local grocery store and it is my saving grace for quick and portable meals. 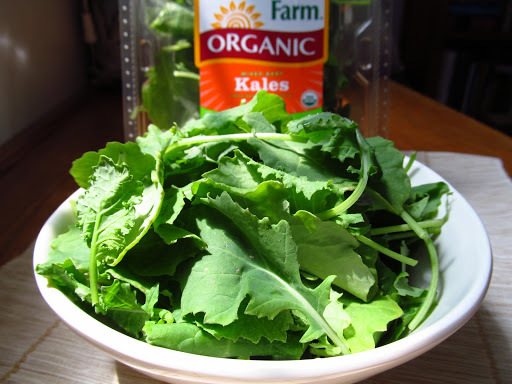 These baby kales are tender, packed with nutrients and, best of all, organic, washed and ready to go! Throw together a handful of these (or baby spinach or leafy green lettuce), some chopped veggies, some protein rich beans, avocado or tofu and some of your delicious homemade dressing and you’ve got a quick and healthy entree for your lunchbox. Next, I try to make a big batch of healthy grains and vegetables that I can use to concoct any number of tasty dishes for both lunch and dinner. At the beginning of the week, cook up a pot of brown rice, quinoa, millet or lentils. 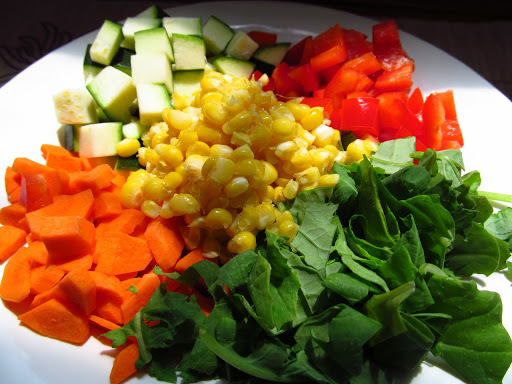 Chop and lightly saute any combo of fresh veggies: bell peppers, zucchini, carrots, cabbage, mushrooms, spinach…whatever suits your mood or whatever you have on hand. You can then use this mixture throughout the week to top some fresh greens, fill brown rice tortillas, stuff some collard greens or simply sauce it up. 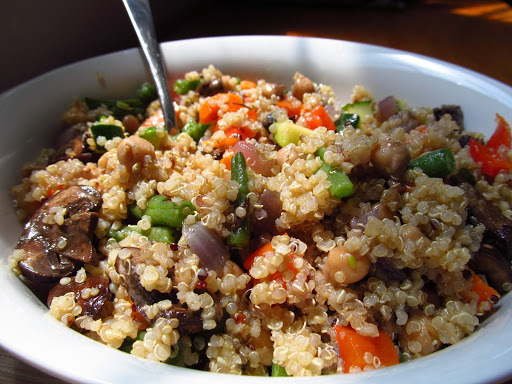 This week, I made a big bowl of quinoa, red bell peppers, zucchini, mushrooms, carrots, green beans and chickpeas. With a batch of our very favorite Savory Tofu Sauce (recipe soon to come! 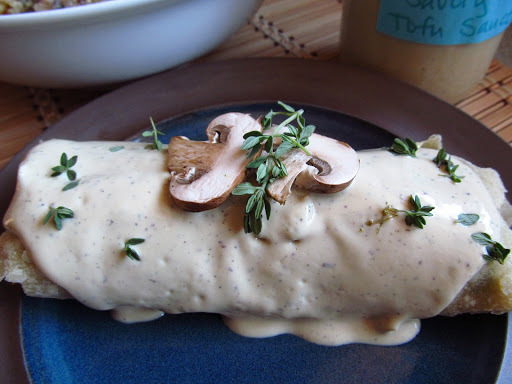 ), this mix makes a delicious dinner of savory veggie burritos on a busy school night. And, said combo also makes for tasty leftovers to pack in your super cool lunchbox for tomorrow. Well, with ingredients for several entree choices prepped and ready to pack, it’s time to consider the snackies. You just can’t go wrong with fresh vegetable crudites. Or a hand full of your favorite gluten-free crackers. 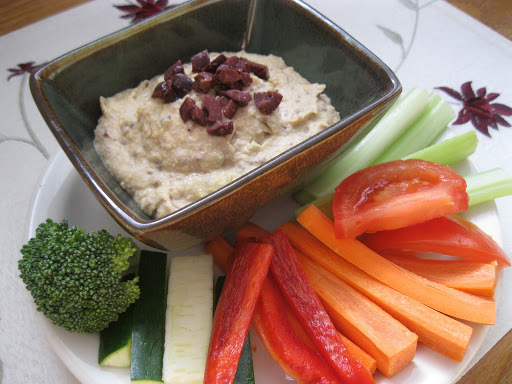 Fill a small portable container with one of your fabulous homemade dressings for dipping or a little protein-packed hemp hummus and you’ve got something healthy to satisfy your afternoon munchie monster. Let’s not forget about a little something sweet. When your days are long and busy and the kiddos are out runnin’ you, it’s important to indulge that lurking desire for treats with some energy boosting sweets. 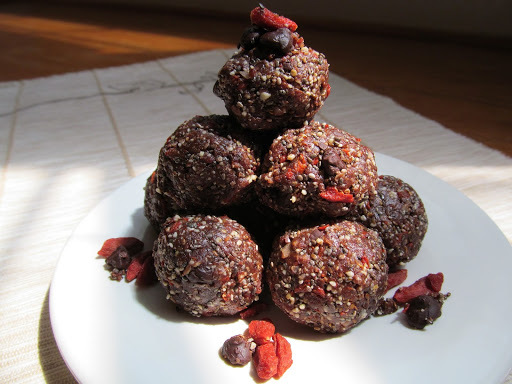 My hubby loves his superfood sweets, so I try to make a weekly batch of goodies to keep in the fridge, like these Acai Berry Truffles or his favorite Dynamite Fudge. Both of these delicious little bites provide the perfect little burst of acai and cacao energy after lunch. This week I made these Chocolate Chip Cookie Dough Bites with chia seeds, goji berries and a few dark chocolate chips…a special indulgence to start the school year off right! 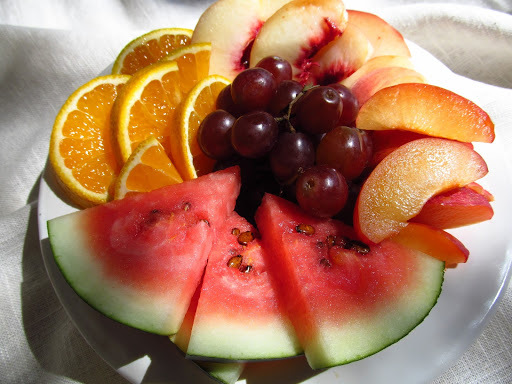 And don’t forget your fruit! I always try to wash and prepare a big bowl of seasonal, organic fruit to have on standby in the fridge, ready to grab ‘n pack. 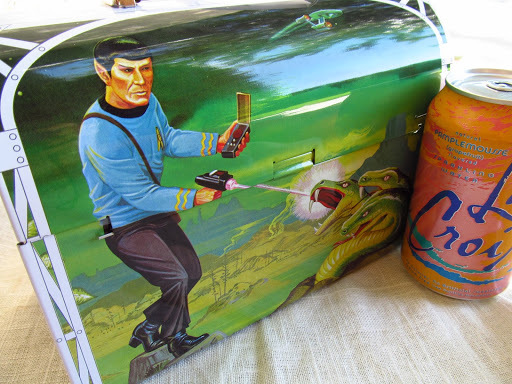 It’s always nice to have it in your lunchbox for those quick between meal snacks. Oh! and a can of bubbly water is easy to pack and a great way to add a little sparkle of flavor to your day. Well, I may not have done my homework, but at least I am prepared for lunch for the coming week! My fridge is stocked with healthy ingredients with which I can quickly pack a healthy lunchbox or fix a quick dinner on a busy school night. I feel satisfied, energized and eager to meet my new crew! 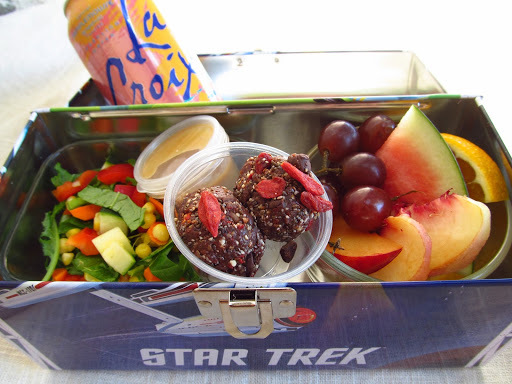 What’s in your lunchbox? If only I had one of those when I was younger, I could have been one of the cool kids!